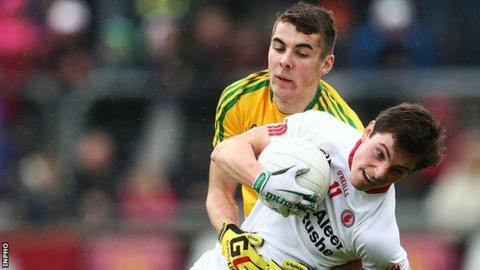 Holders Donegal held Tyrone scoreless in the second half as they clinched a 1-11 to 0-8 win in the Ulster Minor Football opener in Ballybofey. Conor Doherty hit 1-1 in the opening two minutes to put Donegal four ahead but four Conan McLernon points helped Tyrone move into a 0-8 to 1-3 lead. However, Donegal levelled by half-time and dominated the second half. Ethan O'Donnell finished with four points with Kane Barrett notching 0-3 for the winners. Rory Carr and Daire O Baoill also got on the scoresheet for Donegal with Johnny Harkin, Conor O'Hagan, Ryan Coleman and Fintan McClure all contributing Tyrone points.